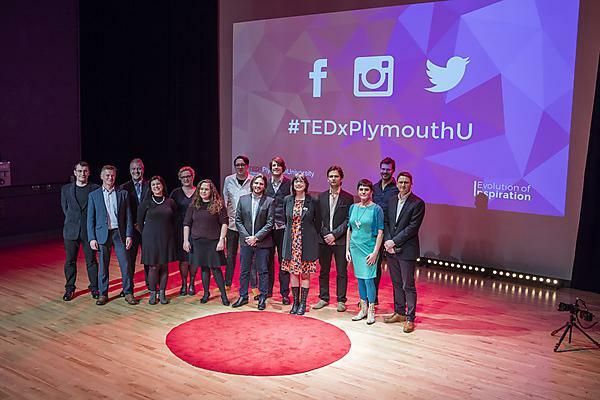 The 13 inspirational talks that made up TEDxPlymouthUniversity are now available to view online. It was an evening that made many ‘proud to be from Plymouth’ – and now everyone can access the talks that made up TEDxPlymouthUniversity last month. University academics and members of the local community made up the 13-strong list of speakers, sharing their thoughts and ideas on a huge variety of topics. Dr Jeremy Goslin from the School of Psychology asked the question ‘When do we want our machines to be more human?’, while equality and diversity professional Jo Higson used her talk to explain why we need men to campaign for women’s rights too. The full list of speakers and videos can be found below. Taking on the theme of ‘evolution of inspiration’, the event was independently organised under licence from international non-profit organisation, TED – which is devoted to spreading ideas, usually in the form of short, powerful talks. With 18 minutes to deliver their idea to an audience of 100, participants were encouraged to add new, important ideas to the global conversation. The only restrictions were that they could not talk about an inflammatory political or religious agenda, or sell themselves, an item or business venture. TEDx is a programme of local, self-organised events that bring people together to share a TED-like experience. These local, self-organised events are branded TEDx, where x = independently organised TED event. TED is a nonprofit organisation devoted to spreading ideas, usually in the form of short, powerful talks (18 minutes or less). TED began in 1984 as a conference where Technology, Entertainment and Design converged, and today covers almost all topics (from science to business to global issues) in more than 100 languages. Meanwhile, independently run TEDx events help share ideas in communities around the world. TEDx is an independently organised TED event. TEDx is run in a similar way, in the spirit of ‘ideas worth spreading’. TEDTalks videos, as well as an atmosphere for meaningful conversations and connections to be made.